DUMBARTON returned to action in the SPFL Championship after their Scottish Cup quarter-final heroics at Aberdeen, and it was no anti-climax. A crowd of 680 at the Bet Butler Stadium — much the same number as travelled to the Granite City — saw them keep up their challenge for a play-off place with a comprehensive 5-1 defeat of relegation-threatened Cowdenbeath on a cold, grey afternoon. Ian Murray's men did not have it easy though. The only goal of the first half was a swerving shot from no.9 and top scorer Mitch Megginson which gave the keeper no chance. Early in the second half on-loan Celtic defender Michael Miller made it two when Chris Kane deflected a cross into his path, but soon after John Armstrong pulled one back for the visitors. It was in the final 20 minutes that Sons took complete command. A Jordan Kirkpatrick free kick slipped through the keeper's hands to restore the two goal lead, then Garry Fleming netted with his first touch after coming on as a sub. Chris Kane rounded off the scoring with the final kick of the game, rounding the keeper and hitting home. 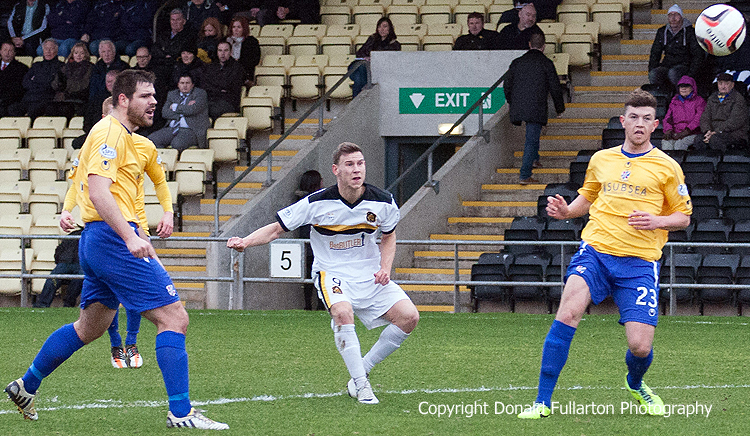 The picture shows Mitch Megginson netting the opener.